Special flat files are used to store watercolor, paper, paintings, or prints. They usually have multiple drawers and are sized to fit standard watercolor paper. The drawers are shallow so that not too many sheets are stacked at once. These files allow the artist to keep the paintings clean and dry until the paper is used or the paintings are framed. 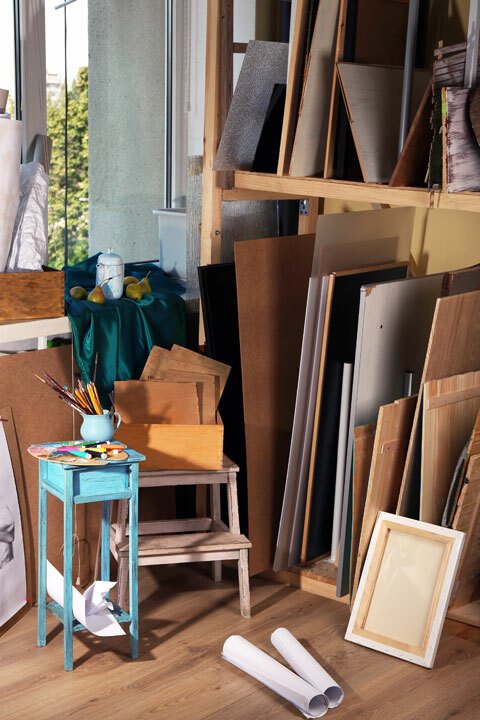 Storage carts are available for storing art supplies, whether in a cabinet or some type of storage drawer. Easels CAPPELLETTO is a world-leader in the manufacturing of streamline products used in the fine arts as easels. All their design products are patented and certified. Traditional methods coexist along with modern innovation technology giving CAPPELLETTO products the extra edge required for the high quality seal. The global marketplace has become CAPPELLETTO's new playground. Their products have gained reputation the world over for their fine craftmanship and superior quality. The great care taken in the selection of raw materials makes CAPPELLETTO emerge from the crowd and tower above the rest. CAPPELLETTO use only the finest quality beech wood for their production. All the CAPPELLETTO products are environment friendly. With CAPPELLETTO the consumer makes a responsible pro-environment choice.